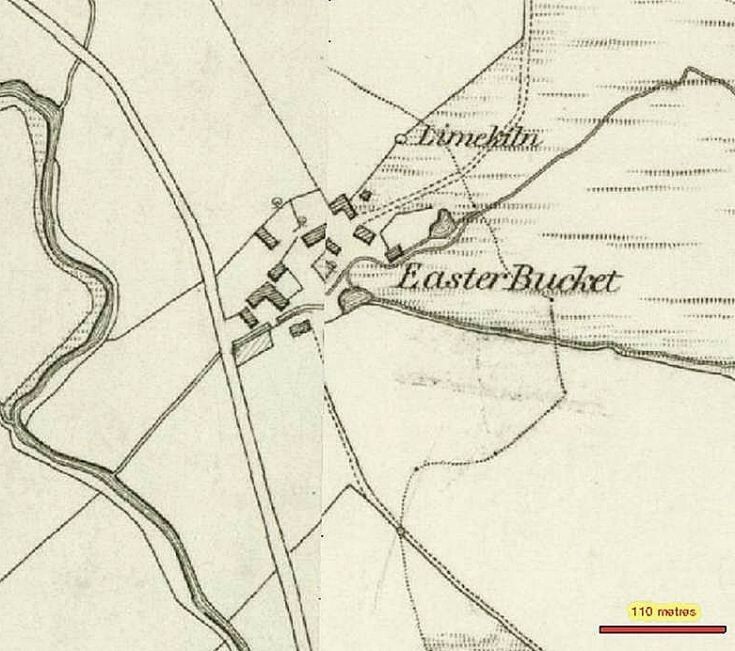 Easterbuchat was the first clachan you would have met entering the Glen by the old road from Delfrankie. Now all that remains is the farm house, steading and another cottage, although you can see from the old map there were previously a number of houses and steadings, one of which was a shop. Below are highlighted many of the families who lived at Easterbuchat over the years. If you look at the achievements of some of the families, they are quite remarkable. The first is the Thomson family who were the last occupants of Easterbuchat, who had farmed the area for four generations. I do not have a family tree for them and perhaps someone may be able to remedy that. The next are the Rannie family who produced distinguished doctors, ministers and a Senior Nurse in the Army Nursing service. The Profeit family, mainly from Towie, by represented at Easterbuchat by one member of the family were quite remarkable and worth of note. As well as doctors , an actor and a vice consul, the most important was Alexander Profeit, the local doctor to the Glen who signed many of the death certificates and became Queen Victoria’s factor at Balmoral. Following his death there was a scandal involving compromising letters between the Queen and her servant John Brown. Thomas Mackie 30 Officer of Excise n.
William Dawson 50 Farmer y.
Ann Horach 14 F.S. y.
Margaret Fraser 85 Pauper y.
Agnes Fraser 75 Farmer y.
John Dawson 25 Ag. Lab. y.
William Simpson 40 Blacksmith y.
William Baunie 45 Farmer y.
Mary Dawson 25 F.S. y.
John Farquharson 13 Ag. Lab. y.
William Forbes 7 Ag. Lab. y. The Prince of Wales yesterday expressed deep concern at the problems of Scotland's hill farmers during a visit to two families in Glenbuchat and Glenlivet, writes Graeme Smith. The prince is staying at Balmoral and asked for a visit to be arranged to two farms. The crisis was discussed over a cup of tea, a bannock, and home-made jam. Accompanied by Scottish Office Agriculture Minister Lord Sewell and National Farmers' Union vice-president Peter Chapman, he arrived at Easter Buchat Farm, Glenbuchat, where he was greeted by owners Bill and Jean Thompson and their daughter Anna, 22, who is a legal secretary in Aberdeen. Their son Peter, 24, a top agricultural student, would have been there had the 68-hectare farm been able to support him but the drop in income has meant he has had to go and work on an arable farm near Alford. Mr Thompson's family have farmed in the area for four generations. ''It is just my husband and I who work on the farm,'' said Mrs Thompson. ''Unfortunately, our farm is no longer financially viable to keep Peter at home so he works on a big arable unit.'' She said they showed the prince around the farm, including the various aspects of a conservation plan drawn up in consultation with the Scottish Office. ''There is tree planting and water margins and we also have a very good wetland area which has a lot of species of flowers which are becoming extinct. ''Prince Charles was very knowledgeable and very sympathetic to the plight of the hill farmer and deeply concerned at the problems we are facing.'' Mr Chapman said: ''We spoke about the current state of the market, the low prices, the problems that causes for the farmers and the sustainability of agriculture in some of these remote and harder areas. ''He (the prince) showed quite a knowledge and obviously takes an interest in what goes on and I am sure he has more knowledge now than he had before. ''He was easy to talk to and it was informal and informative.'' From Glenbuchat, Prince Charles went to Dell Farm in Glenlivet, where he met Gerald and Margaret Stewart, who said he seemed genuinely concerned at their plight. He showed particular interest in a saw mill they have developed as part of their diversification policy. Thomson: Peacefully, at home, on Friday, December 31, 2004, William of Easterbuchat Cottage, Glenbuchat, in his 90th year, loving and beloved husband of Jean Sinclair, much loved father of Bill and Mary, dearly loved father-in-la w of Jean, devoted Papa of Peter and Anna and dearly loved by Caroline and Darren. She married William Dawson, son of John Dawson and Jane Mowat. Marriage: 1816, Glenbucket, Aberdeen, Scotland. 1881: Widowed, lived at Easterbucket with two sons. Occupation Farmer/Doctor, M.B., CM. 1887. D.P.H. 1889. 1861: Lived with grandmother Elspet Bremner at Mill of Glenbucket. He was born at Peterculter and is a son of the late Dr. Robert Rannie, who was Schools Medical Officer for Kincardine. After taking his MD degree in 1924 he went into general practice at Beckenham. Mentioned in Dispatches. M.B., CM. 1890. M.R.C.S.,L.R.C.P., DPH. died Birchfield, Alford 12 Dec 1930. John appears to have remarried; tombstone also lists a wife Helen Reid d Meadowbank , Clatt 11 Sept 1951. James Allanach c 21 Oct 1774 Tolduchul (Tolduquhill). This looks like James Stuart who married in 1811 or 1812 Isabel Rannie who died in 1873 in Craigengour, Glenkindie (d Arthur Rannie & Isobel Gibbon). Ann Allanach Craigengour m 19 Nov 1854 John Thomson]. In May 1869 Penelope Grassick(Allanach) died in Midmar aged 57, daughter of James Allanach deceased and Isabella Allanach ms Rennie, m 6 Feb 1838 (OPR) to James Grassick ( eldest son of Archibald Grassick and Ann McHardy of Corriebreck). Education: King's College, Aberdeen; Master Of Arts 1845. 1854, April 7. John Rannie, M.A., 1845, Parish schoolmaster, Coull Afterwards minister of All Saints' Church, New Amsterdam. Church: Minister in British Guiana. Church: Ordained By Presbytery Of Kincardine O'Neil For Service in Canada, 1857. Church: Minister At Chatham, Ontario, 1859. Church: Appointed To British Guiana, 1876. Education: Bachelor of Medicine; Master in Surgery, Aberdeen, 1882. Rannie, Arthur, M.B., CM. 1882. Died, 24th Jan. 1888 in Demerara. ALCOCK RANNIE ALCOCK : RANNIE - On 20./4/1915, at St. Peter's, Belsize Park, London, N.W., by Very Rev. H.M.M. Harkett, M.A., B.D., LL.D., D.C.L., Lieutenant Benjamin James Alcock, M.D., R.A.M.C., son of Rev. J. Alcock, of Cruden Bay, N.B., to Mary Donald, youngest daughter of late Rev. John Rannie, M.A., of British Guiana, and Mrs. Rannie, of 71, Belsize Park-gardens, London, N.W. Alumnus, King's Coll. 1851-56 ; Aberd. 1860-61. Minister of Shapinshaw, Orkney, 1871. Married on the Thirteenth day of October 1875 at Binscarth Firth after Banns according to the Forms of the Church of Scotland [Groom] Robert R. Rannie, age 39, bachelor, occupation clergyman, usual residence The Manse Shapinsay, father John Rannie (deceased), occupation teacher and presbetor of the Church of Scotland, mother Christian Rannie maiden surname Donald (deceased); [Bride] Jane Jessie Scarth, age 30, spinster, usual residence BinScarth, father Robert Scarth, Esq. landed proprietor, mother Agnes Scarth maiden surname Cathie (deceased). William Spark, Minister at Kirkwall and St. Ola. Witnesses: M. Calder and Cecilia Scarth. Registered 16th October 1875 at Fenstown, John Sinclair, Registrar. Education: Aberdeen University; Master Of Arts, 1869. Church: Licenced By Presbytery Of Forres. Church: Assistant At St. Paul's, Glasgow. Church: Minister Of Shapinsay, 1871; Ordained, 1871. Church: Clerk Of The Presbytery, 1889-1895. South African Medical Jornal. October, 1894. Dr. James Rannie, Klerksdorp, S.A.R. Dr. Rannie was born at Glenbucket, Aberdeenshire, Scotland. He studied at the University of Aberdeen, graduating with honours in 1890. ,During his University career he gained the Fyfe Jamieson Gold Medal in anatomy, as also the Shepherd Memorial Gold Medal in Surgery, besides prize and medals in most of his classes. He was a hard-working student, and was very much liked by his fellow students. He. acted as junior demonstrator in anatomy the first session, and senior demonstrator the second session, after he graduated under Professor Reid. He was also M.R.C.S. Eng., L.R.C.P. Lond., and D.P.H. Cambridge. He then went to London, and was Resident Physician for a few months in South London Fever Hospital, where he was very much appreciated. While there his health, never very robust, broke down, and it was decided he should go to Africa. He first practised for some eight or nine months at Bethlehem, eventually deciding to settle at Klerksdorp where he arrived early in September, 1893. Of fine appearance, genial and courteous in manner, he quickly won for himself a host of friends and a. large practice. He was very successful, and with his kindly manner very soon had his time fully employed. To rich and poor alike he gave his best, and especially the latter have lost a true friend and benefactor. At the end of July he was attacked by a sharp touch of bronchitis, and, complications setting in, his constitution, already worn out, was unable to withstand the further call on it, and he succumbed after an illness of three weeks on 20th August, 1894. Dr. Rannie was a keen sportsman, taking an interest in every department of sport. A genial companion, he was a favourite with all, and no movement for the good of the town or people was without his sympathy and support. He was brother to Dr. Rannie, Peterculter, Aberdeen, with whom and his aged mother much sympathy is felt. Met Miss Rannie who had just arrived from England. Drove her to 14 General Hospital, which Miss Phillips the Assistant Matron went to great pains in showing Miss Rannie each department. Had tea at the Regina. Talked to many of the Nursing Staff and VADs with reference to their accommodation and messing, the toughness of the meat being the main complaint. Tea very nice, table d’hote room, large, airy, many small tables, very clean and fresh looking. Then drove to 6 General Hospital, where I had arranged to stay, and where I met Miss Rannie, the new Matron and Assistant Principal Matron of the area, and the Matron Miss Finlay, No.1 Australian General Hospital. The Hospital is opening up in the old site occupied by 12 Stationary Hospital, where they can only expand to 750 beds, their Nursing Staff being 117, and for the present number of beds they consider 92 Nurses at least will be needed. She and 49 others were taking up their quarters at the Hospital and I promised to visit them in the morning. At 6pm drove to DDMS office, where I discussed certain matters with reference to the Hospitals, and the Australian General Hospital especially. Received telephone message from Miss Rannie that A/Matron B. F. Perkins, 10 General Hospital had been admitted to 8 General Hospital, and seemed to be very ill – that she would be unable to proceed to Villa Roquebrune as was intended. Arranged for a member of the QAIMNS to fill her place at 10 General, and Miss Welman, QAIMNSR, to proceed to Villa Roquebrune. Saw Miss Rannie, who is still seriously ill but the report is that she is daily improving. Received a report from Colonel Pasteur, the Medical Specialist on Miss Rannie’s condition, in which he said it would be some time before it would be safe for her to be evacuated to England and most certainly several months before she would be fit for duty. Sick list: Was informed that Miss Rannie, RRC, A/Principal Matron, Rouen, was being evacuated to England by Hospital Ship and that Miss Perkins, RRC, QAIMNS, who had returned from Mentone, was being sent home by Medical Board as she was not considered fit for duty. Afterwards I went to see Miss Rannie, who is looking very seedy and evidently is not at all well, and was full of many grievances; among the many was her own special grievance of not having been awarded the RRC in the New Year’s Honours. Miss Mary Louisa Rannie, R.R.C., A./Principal Matron, Q.A.I.M.N.S. Awarded a Bar To The Royal Red Cross. 3 June, 1919. Profeit, Robert Alexander, M.A. 1889. V ice-Consul, Tunis, 1894; Vice-Consul, Soulina, 1897 resigned, 1900. Summary Bound collection comprising bound manuscripts of poems and essays that were included in "Under Lochnagar", edited by R.A. Profeit and published in a limited edition of 200 copies in 1894. includes correspondence to R.A. Profeit from Sir Edwin Arnold, John Malcolm Bulloch, the Rev. Archibald A. Campbell, Sir Henry Irving and Rudyard Kipling and from two additional correspondents, signatures illegible. Profeit, Charles William, M.B., CM. 1893.
joined the medical service of the Army, 29th Jan. 1895. Profeit, Leopold, M.A. 1896. Actor. PROFEIT, LEOPOLD: Captain, 8th Battalion Shropshire Light infantry; son of Dr. Alexander Profeit, Commissioner to Queen Victoria at Balmoral; born Crathie, 7 April 1877; educated privately; graduated M.A., 1896. After graduation he went on the stage, playing with Sir Johnston Forbes-Robertson and the late James Welch. At the outbreak of war Profeit was home on holiday from America, where he had been for some years, and he at once joined the University and Public Schools Corps. in December 1914 he was commissioned in the Shropshire Light infantry and about a year later was sent to France. Afterwards he was transferred to the Salonika Front, where he fell near Lake Doiran on 25 April 1917. The attack in which he met his death had been planned by himself and, though fatal to its leader, was successful in attaining its objective. Profeit, Alexander Charles, M.B., CM. 1899. M.D. (com.) 1905. Employed as a Civil Surgeon under the Royal Army Medical Corps at Netley, 1900-03, and at Shorncliffe in 1904. Profeit, William James, M.A. 1892. B.Sc. (Agr.) 1903. We regret to have to record the death of Dr. Alexander Profeit, Her Majesty's Commissioner upon her estates at Balmoral. Dr. Profeit has been in failing health for the last two years, and was on the point of surrendering his commission at the time of his death. Dr. Profeit was a native of the parish of Towie, in Aberdeenshire, and began his education at the parish school. He proceeded to the Grammar School of Aberdeen, and the University of Aberdeen, where he graduated in Arts in I855. Two years later he qualified in medicine, and settled down in practice in his native parish. He afterwards engaged in practice in Tarland, and finally in the parish of Crathie. When his friend, Dr. Robertson, resigned the Queen's Commissionship, twenty years ago, Her Majesty appointed him to the vacant post, which he has since filled with singular success and acceptance. He took an active interest in local affairs, and occupied the offices of Justice of the Peace, county councillor, and Chairman of the Parish Council. He was an agriculturist of no mean note, and successfully developed the Queen's polled Aberdeen herd, which carried off many prizes at the leading shows in England and Scotland. Dr. Profeit's engaging personality, devotion to duty, and business capacity gained for him the esteem and confidence of his royal mistress and the household, as well as of the public at large. He had a quite unique acquaintance amongst royal personages, from whom he received many tokens of regard and esteem. At Court, his services were indispensable. One of his last public duties was to take part in the arrangements for the reception of the Czar, upon the occasion of his recent visit to Balmoral. Dr. Profeit's remains were borne to their resting-place inCrathie Churchyard on Monday last, upon the shoulders of the keepers and gillies on the estate, and wreaths from the Queen and Princess Beatrice were laid upon his grave. In 1905, King Edward VII set the hounds in motion to retrieve letters written to Alexander Profeit, Queen Victoria’s factor at Balmoral whose job was to run the estate – and responsibility for the estate’s servants . . . and among them had been the Highland ghillie, John Brown, Victoria’s personal servant and probably her closest friend and confidant in the long years of widowhood after the death of Prince Albert. As shown in the film “Mrs Brown” where Dame Judi Dench portrayed Victoria and Billy Connolly played John Brown, the Highlander spoke frankly and bluntly to the Queen – more than her children could ever manage – and his distaste for the Prince of Wales, later to become Edward VII, was manifest and, within Royal circles, public. indeed, when Victoria died he went through the Royal homes destroying everything that had memories of the servant he considered an upstart. But Edward must have feared there was more to the “Mrs Brown” jibes and gossip. in fact, there had been a rumour that Victoria and Brown had secretly married! Whatever smoking guns there were, Edward was determined that they would never be found. So, when Alexander Profeit’s son contacted the King in1904 with an interesting “proposition”. He had found some 300 letters written to his father by Victoria . . . and the mentioned John Brown. The King reacted promptly, calling in Sir James Reid, a trusted courtier of many years’ standing. Reid was, however, a doctor who had attended the Queen, nursed her in her last days and was now physician to her son. Hardly the qualifications for a cloak-and-dagger project. But he was trusted totally and secrecy was everything. Sir James then went personally to see the King who must have been mightily relieved to get his hands on them, especially as the doctor later admitted that he had taken a peek at the letters before handing them over. He thought many of them “most compromising”. There is no record of what Edward VII did with the letters or of how much he paid for them. It’s safe to assume that they were confined to a Royal bonfire. If there is a Royal paranoia about correspondence, it stems from Queen Victoria who wrote scores of letters every day to all and sundry, while keeping an extensive and outspoken personal diary. It has been estimated that Victoria may have written some 60 million words in her lifetime, but only two million have survived. The first signs of the paranoia saw Victoria’s youngest daughter, Princess Beatrice, scour her mother’s correspondence, rewriting the sections that she thought were fit to be seen by the rest of the world. Since Victoria, her successors have shunned such prodigious letter writing and diaries. But when there has been the danger of someone in the Royal Family having been indiscreet, they have lost no time in covering their tracks. cause: Paralysis 1 year. No medical attendant. informant: Ann Thomson her X mark, daughter (present). James Wattie Registrar, witness.